This monument is erected in memory of the pioneers buried here, there are about 20 whose resting place surrounds this monument. The first grave was that of Nancy Maria Biglow Love, who died November 27, and was buried November 28, 1852. In 1852 there were only three pioneer ranchers and their families living here. In 1853 Indian trouble forced them to move to Nephi. After Mona was settled in 1859, it served for a burial ground until 1869. John Rowberry, wife and five children Josiah Call, wife and one child, Cyrus Tolman, wife and two children, Judson Tolman, wife and one child, Orson Bravett, wife and five children, Samuel Mecham, Robert Skelton, Ben. Tolman, Captain Wright, wife and one boy F.X. Lougy. See also, Crescent Junction Rest Area. 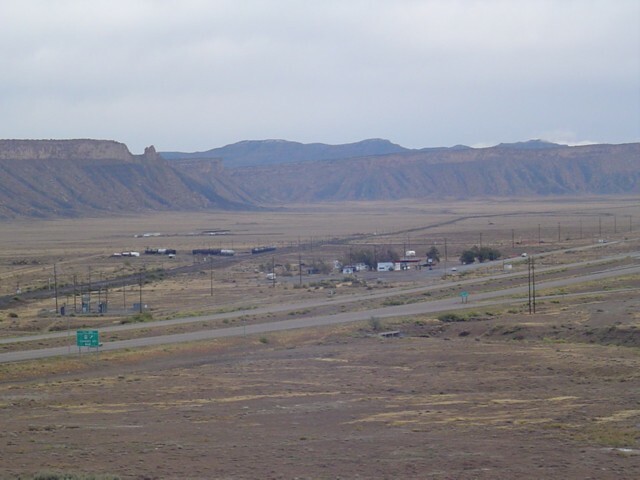 Crescent Junction (or Brendel) is a small unincorporated community within Grand County. Most highway maps use the name Crescent Junction, as the name given to the junction of Interstate 70 and U.S. Route 191. Most railroad maps use the name Brendel, the name of the rail siding and junction at the same location. The origin of the town is the Denver and Rio Grande Western Railroad which constructed its main line through Eastern Utah in 1883. However the only thing that existed at this location was the rail siding, called Crescent for the crescent-shaped formation of the Book Cliffs in the area. A town formed approximately 5 miles east at the next rail siding, Thompson Springs. Thompson became a transfer point to unload goods from the train for shipment to other cities in the region without rail access. 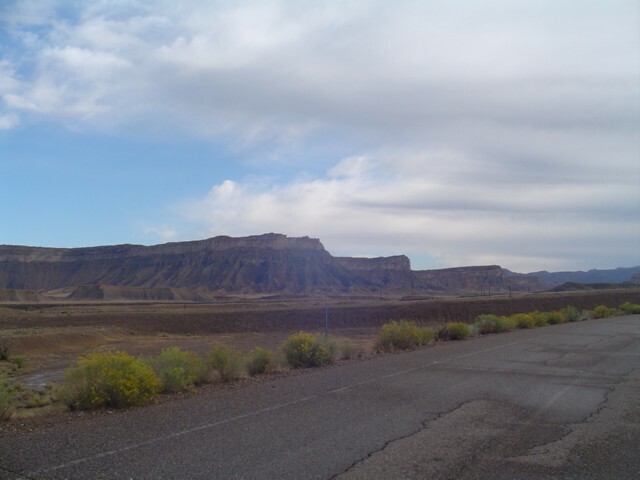 Floy or Floy Station is a railroad siding, there is a ranch exit off I-70 between Green River and Crescent Junction where you can pull off and explore. 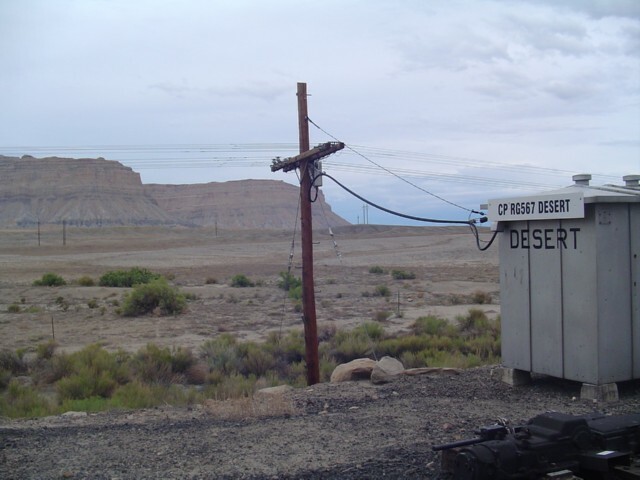 Desert is a railroad siding along highway 6 near Woodside and north of Green River. Desert Siding doesn’t have much to see but I enjoy stopping there to look around. The foundation work on the Salt Lake Temple was nearing completion and soon would be ready for the granite upper walls. The four day trip from the quarry with oxen-drawn wagons could not possibly provide stone as quickly as it was needed. To expedite delivery and also to reduce the cost by three-fourths, a canal was proposed on which the stones could be delivered on barges. Though conceived as early as 1849 the canal was long in coming and a first venture, a segment began in 1855 from Big Cottonwood Canyon to Red Butte Canyon, was a failure. 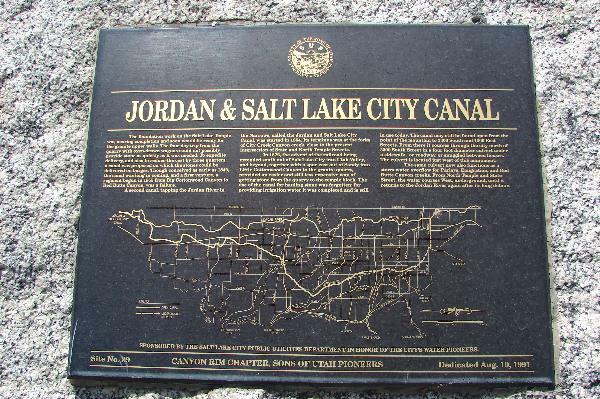 A second canal tapping the Jordan River in the narrows, called the Jordan and Salt Lake City Canal, was started in 1864. It’s terminus was at the forks of City Creek Canyon Creek, close to the present intersections of State and North Temple Streets. In 1872, the advent of the railroad being extended south out of Salt Lake City into Utah Valley and beyond, together with a spur east out of Sandy into Little Cottonwood Canyon to the granite quarry, provided an easier and still less expensive way of getting stone from the quarry to the temple block. The use of the canal for hauling stone was forgotten; for providing irrigation water it was completed and is still in use today. The canal may still be found open from the point of the mountain to 3300 South and 1300 East Streets. From there it courses through the city north of 3300 South Street in a four foot diameter culvert under a sidewalk or roadway or snuggled between houses. 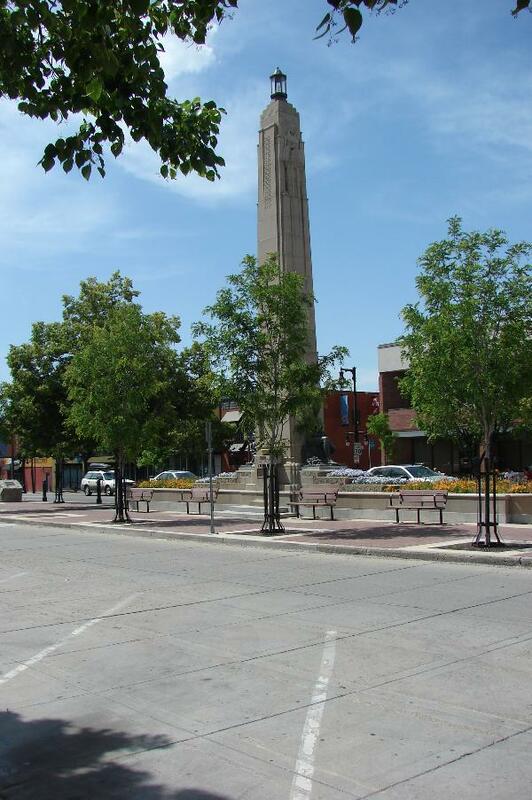 The culvert is located just west of this monument. The same culvert now also functions as a storm water overflow for Parleys, Emigration and Red Butte Canyon Creeks. From North Temple and State Street, the water courses west, underground, until it returns to the Jordan River again after its long detour. Sponsored by the Salt Lake City Public Utilities Dept. in honor of the city’s water pioneers. The Sugar House Monument is located next to this historic marker. Fort Harmony was constructed of crude (without binding materials) adobe. The walls were 300 feet on a side. Houses along the inside of the 10 foot east wall were one story high. Houses along the inside of the 16 foot west wall were two stories high. Culinary water was obtained from a well. Irrigation water for the fort and surrounding areas was supplied by Kanarra and Harmony Creeks. Brigham Young sent missionaries to southern Utah to work with the Indians. In March of 1853, a wooden fort was built by the John D. Lee party near Ash Creek in northern Washington County. But they soon discovered the site was too small and too farm from the fields they would need to farm for their sustenance. Subsequently, they located a site four miles to the north. Brigham Young gave them instructions as to how to build it and turned the first dirt on the southeast corner. A new adobe fort was built between May 1854 and February 1855. It was the first fort in the territory to be made of adobe brick, as the Spaniards suggested. Fort Harmony served as the Washington County seat and was the hub of all colonization efforts south of the Great Basin. It served as a stopping place for traveler passing through the area. The fort was occupied for seven years. But Fort Harmony was abandoned after 28 days of heavy rain washed away most of the adobe walls in January and February of 1862. The adobe bricks were not made with straw or horse hair that would have made them more durable. Most of the occupants moved a little ways west and created the town of New Harmony or moved east to Kanarraville. 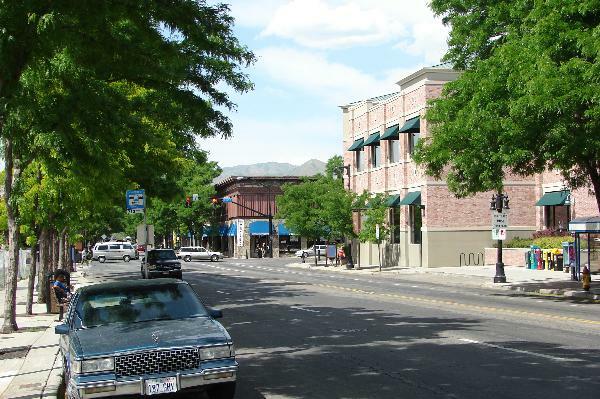 http://www.fortharmony.org/ and http://www.wchsutah.org/towns/new-harmony.php are very useful. Two photos I got from this website. 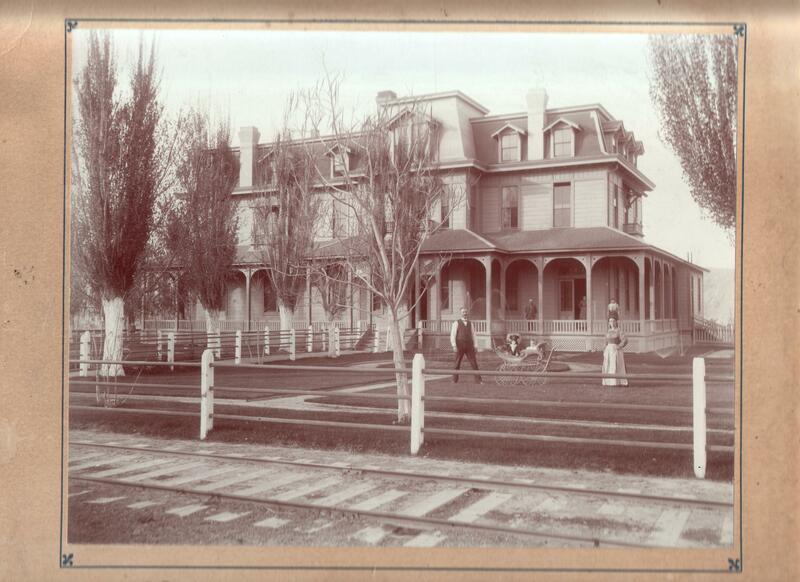 In 1852, John D. Lee and others settled Old Harmony on Ash Creek, later known as Kelsey’s Ranch. The name Harmony came from Harmony, Pennsylvania where the Mormon Prophet, Joseph Smith, translated the Book of Mormon. The local settlers also liked the name because it suggested the harmony and united action the pioneers wanted to engender during their periods of trial and hardship.